The 2nd half of the awards ceremony was this morning. Yesterday, athletics & academics. Today, graphic arts & creative arts. Amy, Melissa, and the other National Committee members called out the names of the winners, and the newly elected officers – including 2nd VP Narayan Sundararajan – handed out the ribbons. A number of OH names were read. 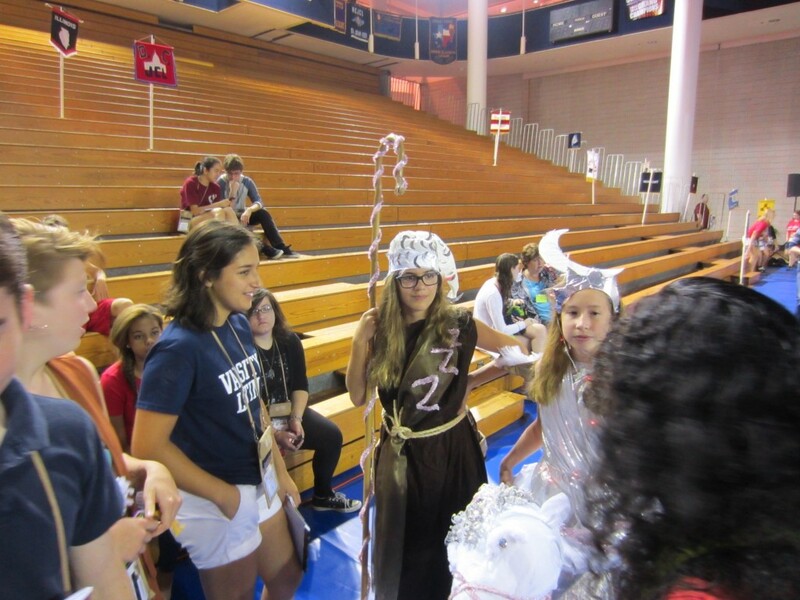 Sara Zandvakili lent the helping hand of the JCL and collected ribbons for fellow students who were not present. Nice job, Sara! Some of the OH students listening for their names at the awards ceremony. Julia Dean and Caroline Kubicki (both of Summit) had their moment in the spotlight during the Creative Arts Awards. 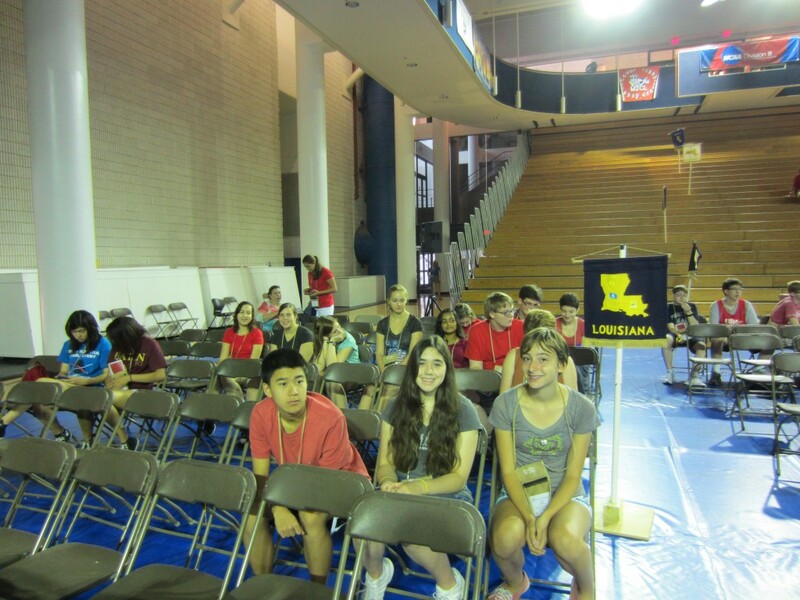 It is a tradition to select a few ‘Best of Shows’ to present on stage to the other students. 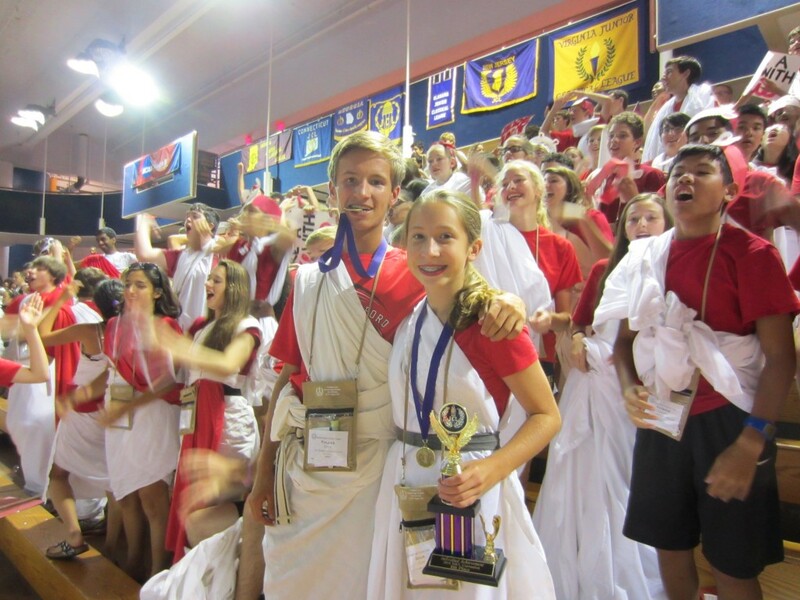 There was a great Dramatic Interpretation of ‘Coriolanus’ Mother Begging her Son Not to Attack Rome.’ The audience heard a student speech on the convention theme, ‘For the beginnings of all things are small.’ And then Amy Elifrits called up Julia and Caroline to explain their costumes. The girls were well-spoken and poised on stage. Click here for a 2 minute video of Julia Dean and Caroline Kubicki (both of Summit) presenting their Best of Show Couples Costume on stage. Caroline & Julia greet some admirers. SaraZ, the ribbon collector, is on the left. After lunch, I went to a colloquium in the basement of the Carlos Museum here at Emory. Dr. Cupello had out a map from the 18th century which was a copy of a 16th century map of Rome. It was cool seeing this old and rare map up close. The cartographer, Ligorio, had made a number of good, and not so good, guesses about ancient structures before the benefit of archaeological finds since then. Dr. Cupello had been with Mrs. I at her summer with the American Academy in Rome. 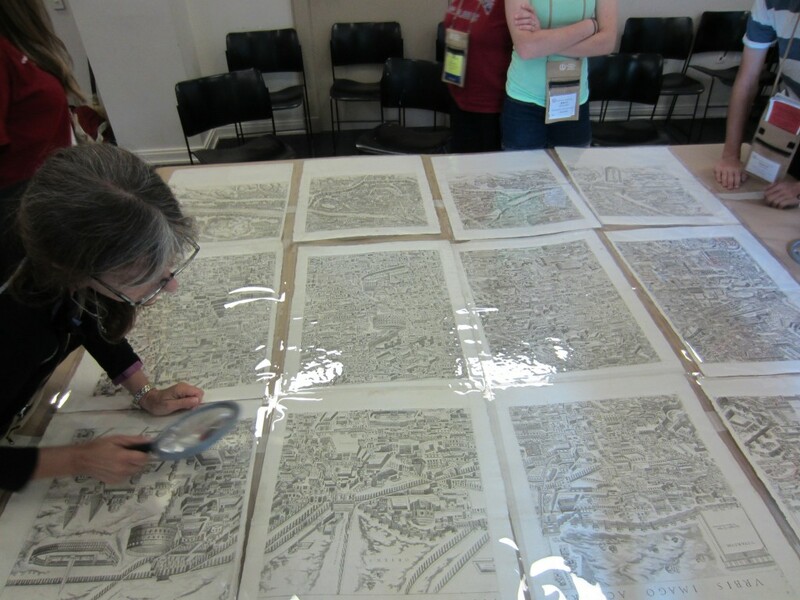 Christy Bening examines the map more closely. 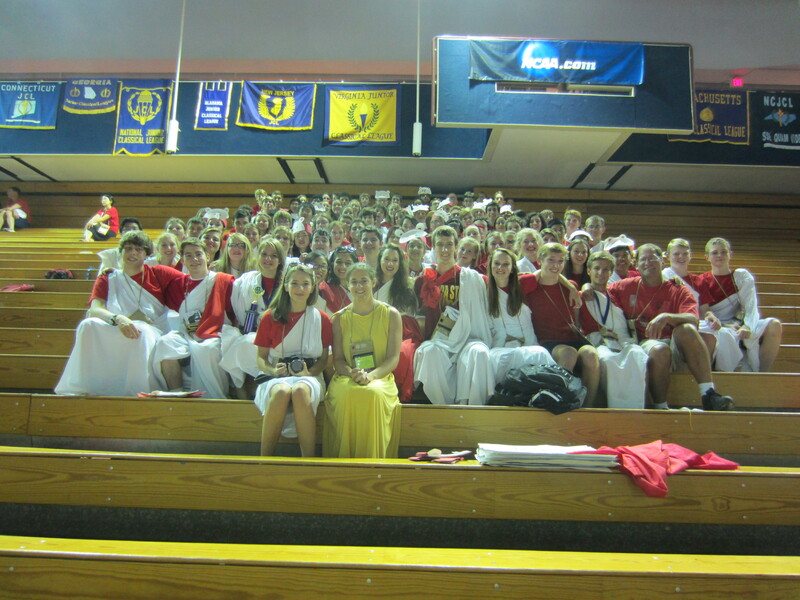 The afternoon had the annual Toga Parade. The theme was ‘Timeless Cola Classics.’ It was a bit hot, but the route was rather short, esp. when compared with some of the death marches in the past (e.g., the odyssey to the FargoDome or the waterless trek through the KY campus). Here is a 1 minute video of the OH delegation during the parade. out of 1,600 students: Julia Dean (Summit) was 7th in academic points and 10th in total pts! out of 1,600 students: Lindsey Dierig (Turpin) was 2nd in graphic arts and 3rd in total pts! 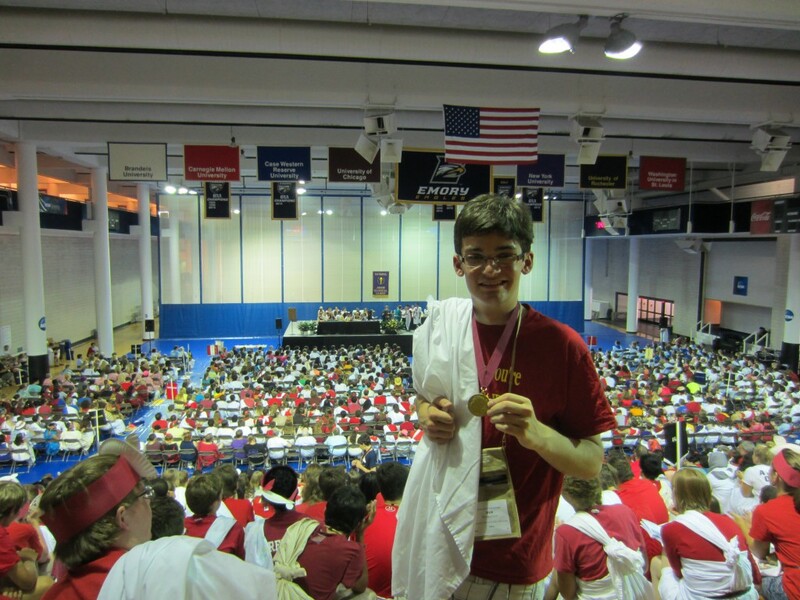 out of 1,600 students: Ben Robertson earned THE top score in Greek Derivatives! 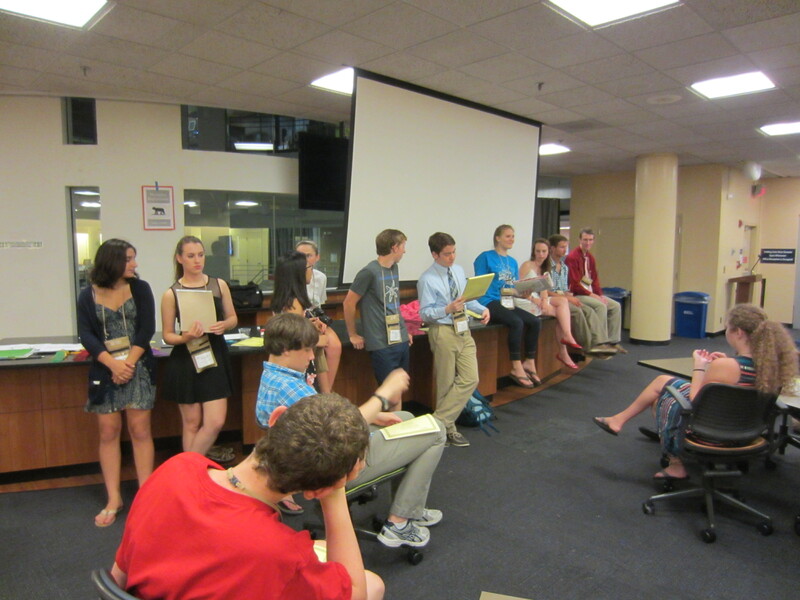 Narayan Sundararajan (Shaker) was sworn in as the NJCL 2nd VP, and Maddie Briner (UTenn) was sworn in as the NSCL Historian. The Dean kids with their awards. 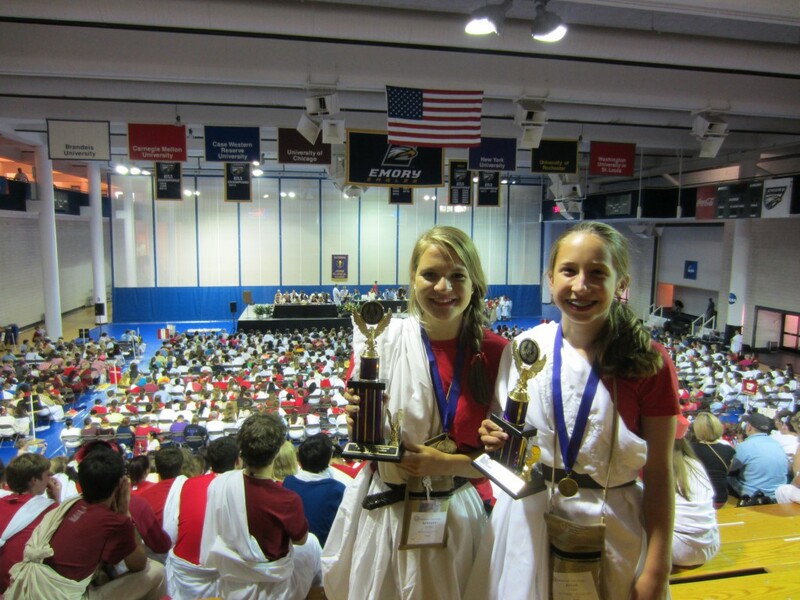 Lindsey and Julia with their awards. 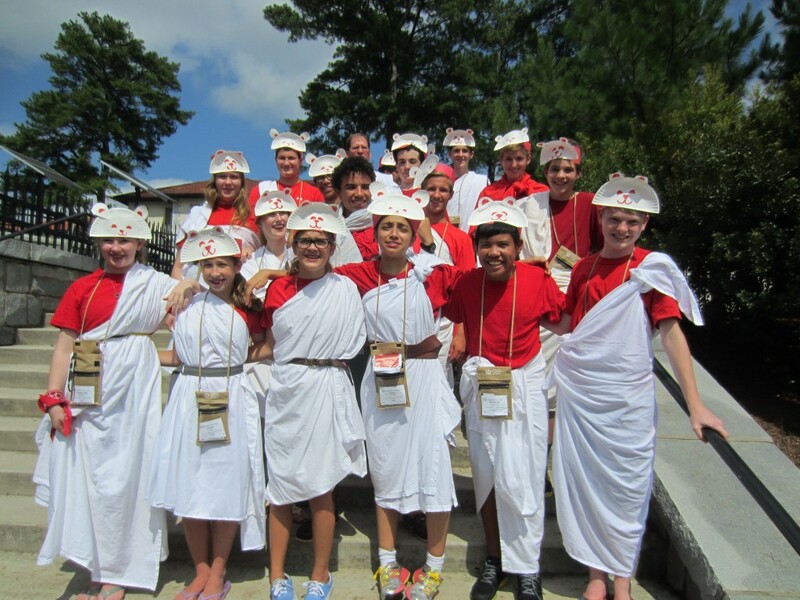 The last night means the World Series of Certamen and the Bad Larrys. Joining the traditional twosome of Brian Compton (Moeller) and Larry Dean (Summit) were ‘Mandrew’ Boudon (formerly of St. Edward, presently of Holy Cross) and Mollie Rose Effler (formerly of McAuley, presently of Notre Dame). [Bad Larry was disappointed that his own 2 children did not watch the matches, but he assumes that there must have been some emergency which prevented their presence. He hopes that all is well.] Every Bad Larry put pts on the board. I got so excited during the answer to one question that spit visibly flew through the air (but I got it right!). Answers included: the lawgiver Draco (from whom we get draconian), Who farted? (nice work, Andrew), a dramatic telling of the Daedalus story, the emperor Elagabalus (go Brian! ), and the Res Gestae. We did well enough in the 2 preliminary rounds to make the semis, but – as is typically the case – we did not advance to the finals. 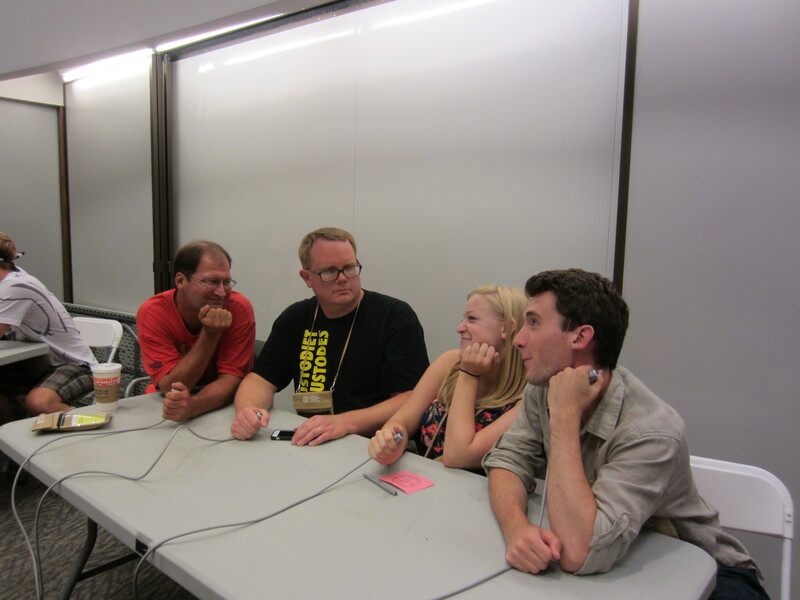 We did get 2nd place in the round and got the coveted visual question. Oh, and we were beat by a team called ‘It’s Hard to Kidnap the Bad Larrys,’ so at least our name was somewhere in the finals. The Bad Larrys: Larry, Brian, Mollie, and Andrew. I have no quotes b/c all the teachers were busy handing out certificates and other awards. We went over the plans for departure tomorrow. The Cincinnati bus is leaving by 7 am, so there will be some serious sleeping early in the ride back home. I had to kick people out of the fellowship to get them to the dorms on time. There were a lot of hugs and some tears too. 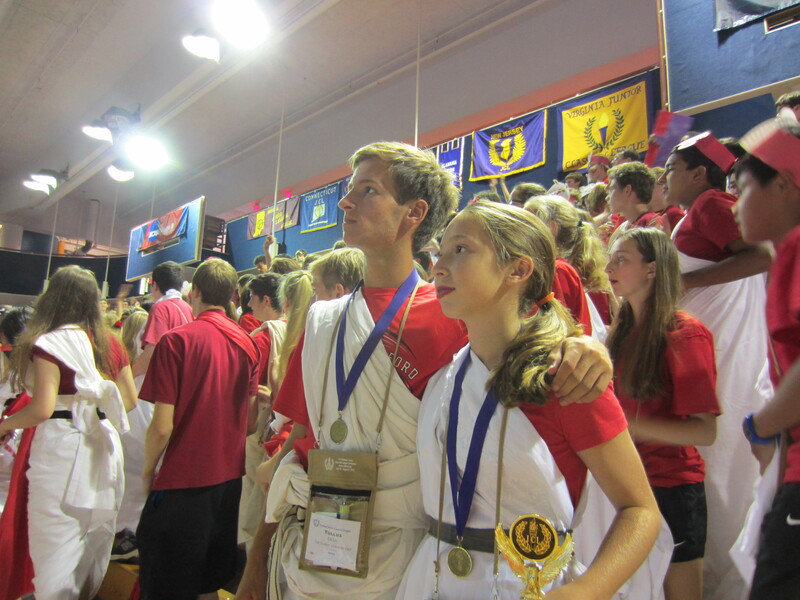 Tullus and Julia gaze into the distance and think about next year at Trinity University.